This is a sponsored post. All thoughts and opinions are always my own. Back to school time is sneaking up on us again. It seems like just yesterday, my kids were wishing their teachers and friends a good summer. Every August, I head with my kids to my local H&M store to stock up on trendy fall styles for back to school. This year, H&M has a great selection of sequined tops, trendy stripes, and must-have basics. I have shopped at H&M for our entire family for years. I’m always impressed with the quality of their kids’ clothes and always love how pieces from H&M mix and match together so well. 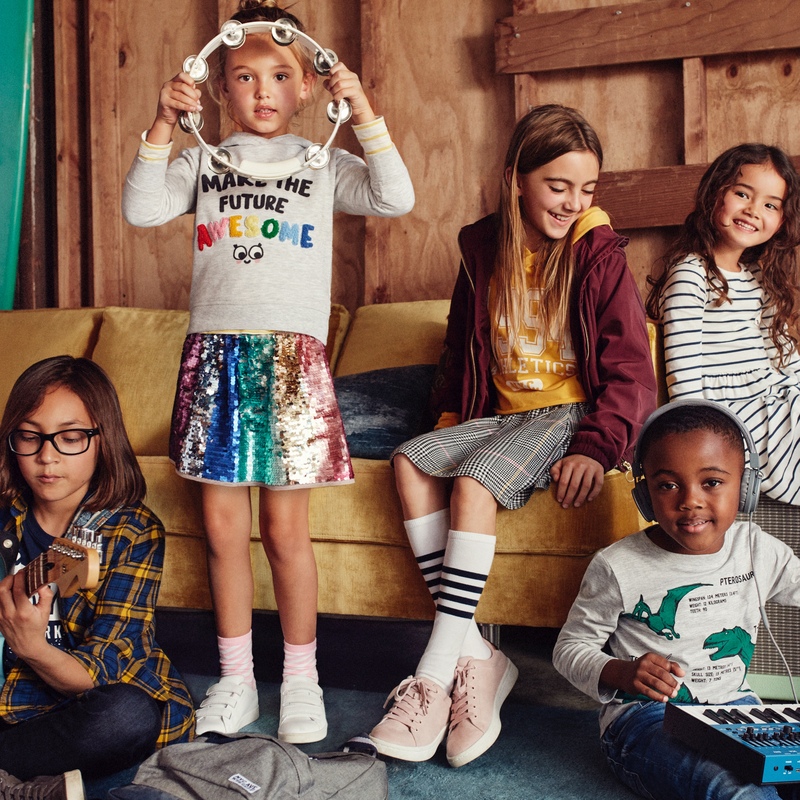 H&M currently has everything you need to complete your child’s back to school wardrobe in store and online now. The best part is that H&M clothing is very well priced. The kids and I headed to our local store and picked up a few things to get them started in September. My son picked out a super cool sequined LEGO Ninjago t-shirt, a hoodie, pants and a sweatshirt. My daughter picked out a cute sequined shirt and stretchy leggings. Ready to stock up for fall? 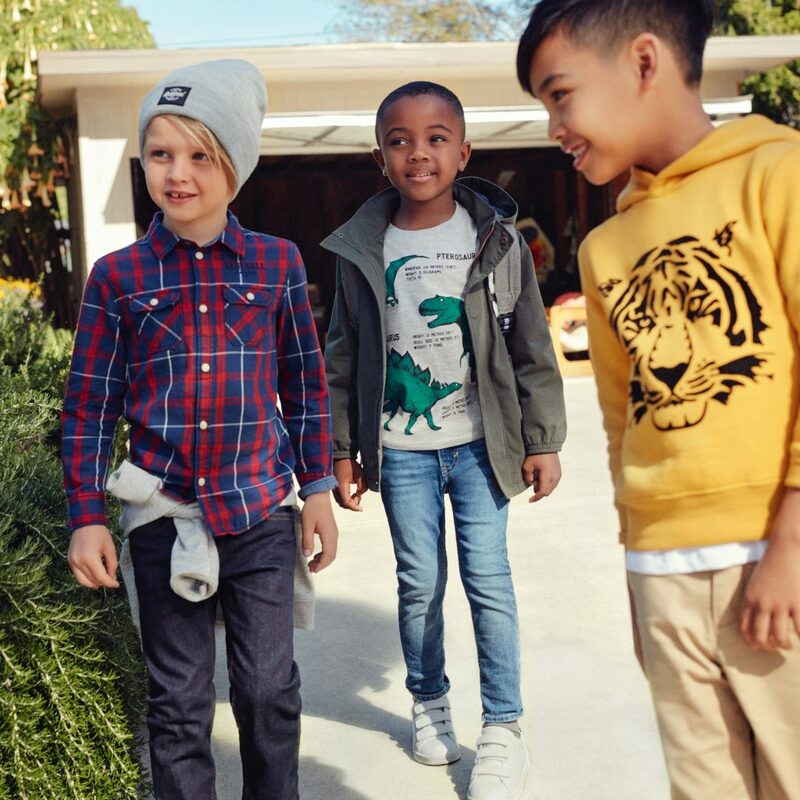 H&M’s Kidswear sale starts today! Save 20% off all kidswear purchases over $60 online from August 16th – August 20th and in-store from August 16th – Sept 3rd. Terms and Conditions: Offer valid until September 3, 2018. Offer is valid on all kids regular-priced items. No coupon necessary. Excludes H&M employees. 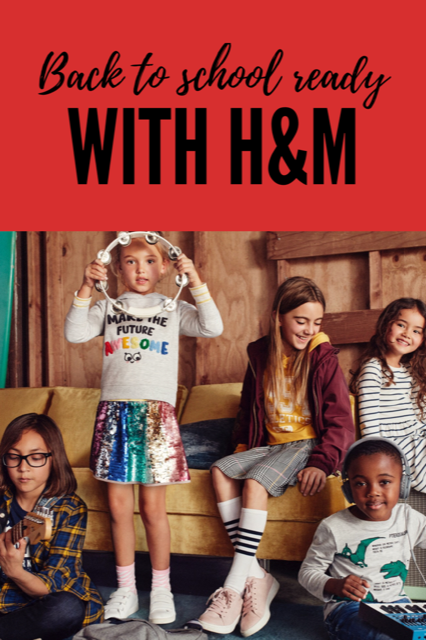 Offer not valid on previous purchases, for H&M gift cards or in conjunction with any other offer, including 3 FOR 2 Mix & Match offer and Kids Top + Bottom deal. Offer valid in H&M stores in Canada only. H&M Canada wants to help you with your Back to School shopping! They are offering a $300 GC to one of my lucky readers! To enter, check out what’s new at H&M and tell me in the comments what you’d spend your gift card on (include a link to what you’d get if you want!). Then fill out the Rafflecopter form below. Giveaway is open to Canadian residents. Mandatory question must be answered to be eligible to win. Giveaway runs from Aug 17 – Sept 3, 2018. Winner will be contacted by email and has 48hrs to claim their prize. Void where prohibited. See my terms & conditions for full giveaway info. I’d buy those cute boy’s corduroy pants from H & M.
http://www2.hm.com/en_ca/productpage.0664003001.html love the look – dress and boots! I would buy my son some Slim Fit Chinos ad hoodies, such great stylish clothes for kids and adults both. I would get some new pants for my son. My grandson would love the Twill Pants and the Printed Hooded Sweatshirts! I would buy some nice clothes for my son! My little niece’s feet are constantly growing and she needs new shoes every couple of months! I would definitely scoop up these cute boots (she’s a huge Minnie fan!!) and definitely some leggings and a warm cute. Thanks for the chance at this awesome giveaway!!!! I would purchase new dresses for my granddaughter. There are so many great outfits. I would get the Jurassic World t-shirts and some of the superhero shirts, some sweatshirts and some joggers. My kids like comfy clothes. My kids would be so excited for new leggings and shoes! wow 300$ would certainly get alot of neat outfits for the grandkids, I’d have to let them choose though or maybe…grab them a couple of things and head to the H&M home section and grab something nice for me! New joggers and high top shoes for my son, and back to school jeans and tops for my daughter!!! Where do I start! We have a family of 6 and H&M is always our go to for the newest trendy fashions for Men, women and kids!! One stop shop makes us all feel great! No stress bc from casual to dressy to work…to the hottest accessories and SHOES….you guys have it all!! My Family would LOVE me if we won this gift card!! I would buy jeans and the ankle boots for my son who is 9 and some of the disney dresses, leggings and tops for my daughter who is 5. My kids would be so excited to receive a shopping preee like this! My kids would love the sequin flip shirts! I’d spend a good portion on fall wear that looks cold and can weather fall temperatures. I’d use it on shoes and clothes. I would spend my $300 on some of the work-week refresh collection! I would buy boots and sweaters for all. 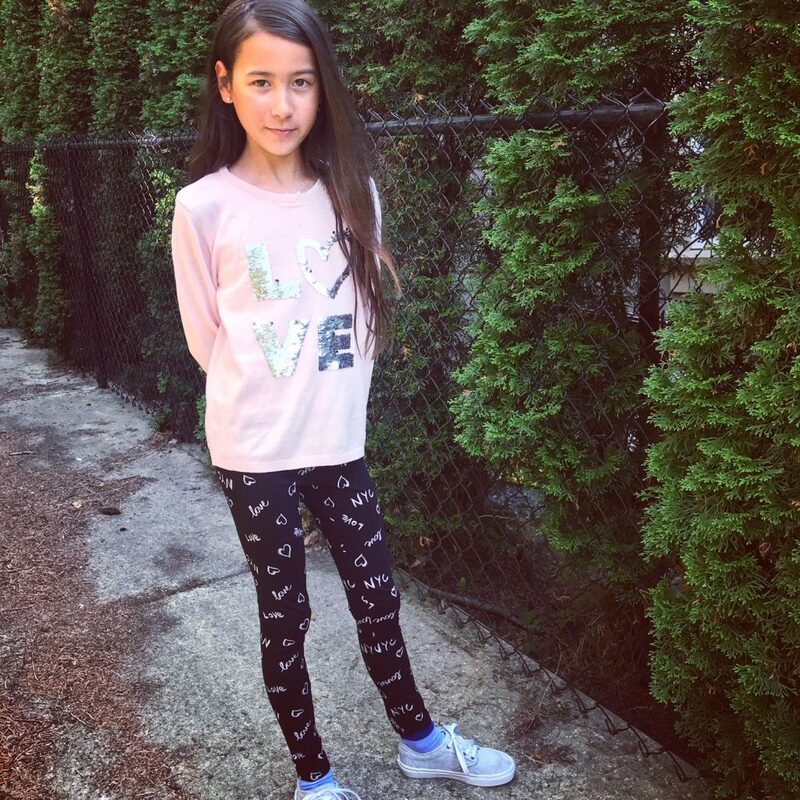 My daughter would love leggings, jogging pants the most. She also really likes shoes and I would get myself some shirts. I would get my daughter some tights for back to school. The cardigans for fall look awesome. Love the Rib-knit Cardigan and the Hooded sweatshirt cardigan. I would buy some mew hoodies for the fall, socks and some long sleeve tshirts. My Daughter would love this as would my Wife as it’d save us money! Both my boys need and would love some new joggers. They are also in need of new softshell jackets for fall. Winning this would certainly help keep the kiddos warm and stylish this fall/winter! I would get a new jacket and some work clothes. I love the Lightweight Down Jacket in black. Need a new wardrobe for fall. I would get some sweaters. I would buy a pair of plaid pants and a white button-up shirt! Great clothes for good deals ! My son loves those sequin flip shirts so I’d definitely get him the lego versions! Wow where to even start! Love H&M- would be so thrilled to have a shopping spree there for myself and my daughter! Over sized sweaters for the fall season to wear with leggings and boots ! I would buy a few things for my sons. I would take them shopping with me so they could pick out something they like. I would pick up this adorable and very fashionable sweater! I would get the Chelsea boots, some 2 pack hooded shirts, some leggings, and the long belted sweater for Callie to go back to school. I’d buy some new 4T pants and cute graphic tees! I would spend it on some jeans for my son! I would take my daughter shopping and she would probably want to get the Chelsea Boots, the sequinned skirt, some jersey dresses, leggings and a few other items. There are so many beautiful outfits at H&M! I love the boys shirts from H&M. I would love to buy a bunch of them for my boys. Also, some new jeans and ball caps. I love their conscience collection. I’d buy long sleeve tees for my son and dresses for my daughter. I would love to get jeans, runners, t shirts and this jackethttp://www2.hm.com/en_ca/productpage.0453258007.html for my son!! I would get some cute new clothes for both my boys, and of course something for myself! Maybe some new accessories. I would spend it on tshits, cardigan, dresses. I would get super slim jeans. printed leggings and a coat. When we were in H&M last time my daughter fell in love with the sequin skirt snd unicorn sweater that were in the window, so I would for sure start with that outfit because she would be ecstatic! Leggings and sweatshirts. All lovely. We love their solid colored hoodies and their jeans! I would take the October birthday boy shopping and let him select whatever he wants! I usually look for the deals (H&M has awesome styles) and he doesn’t get a say. I would spend it all on my daughter as she’s starting a new school and could do with a new wardrobe! I would buy back to school clothes. Leggings, Sweater Dresses. I will spend in on pants and a new coat. I love H&M I got my son the cutest tie there!!! New coats and shoes would be first! I would spend it on new jeans and hoodies for the grandchildren. I would stock up on the oxford button down shirts. The Chelsea boots are a must have as well. I would spend the giftcard on the J Baker patterned dress (black with floral print) in both long and short, the striped jumpsuit, and a bunch of bedding. we would spend it on all of the kids leggings and a sweater with the funky sequin pattern reversal thing because she desperately wants one. H&M has THE BEST organic cotton sweatpants! I’d buy character t’s for my son! For sure a pair of these to match mine! I’d start with jeans for all the kids and then some shirts for back to school. and then a bunch of tops. If I won I would get some clothes for my hubby. I would get him a Regular Fit Oxford Shirt http://www2.hm.com/en_ca/productpage.0673133001.html , hooded jacket in black, Leather Derby Shoes and other basics like socks. Fine-knit Cardigan! Old one got ripped up! I’d love to get a bunch of sweatshirts for my kids. They are hard-wearing and last a long time. Leggings and T’s for my kids! My daughters love anything sequin! We love the sequin shirts and skirt! There are so many great pieces there – but the Jersey Top with Sequin Motif caught my eye! My daughter’s into a size small in ladies sizes now and she’s go crazy! This would be amazing for BTS! She’d love jeans and a jacket and she’s really into sweaters, the burgundy/multistriped one would be at the top of her list for sure. I would buy some cute new sweaters! I’d get a few new dresses! i would get fall wardrobes for both of my kids! I would buy my son whatever he wants! My wife, daughter and to-be-born son would be getting their fall/winter stuff from H&M! I’d actually get home stuff….my son needs new bedding, and the bathroom could use a make over as well. New pjs for the family! I love this trench coat and it’s beautiful colour so I would get this for myself! I would also get something for my baby niece! This seemed adorable. Mostly on my son to get him away from his sports track pants. He needs jeans, tops, socks you name it. I would also get a couple nice tops for my daughter as well. I’d get some cute sweaters! Cute seasonal items from the Home section! I’d buy dresses and cardigans for myself. I LOVE the Pleated Dress in dark blue! I would buy clothes for the entire family! My son definitely needs shirts and pants. Just today he came in and wore a hole through his shoes also! I would get a few sparkly sequin tops and some leggings ! I would like to get the Hooded sweatshirt cardigan and the Padded Parka with Hood. The hooded bomber jacket in dark blue would be just perfect for my son & great for fall! I also would get the biker jacket for my teen daughter & the super skinny high jeans as she loves all her pants high waisted! I’d spend it on a bunch of cotton long sleeved dresses for my daughter in a bunch of sizes, and new pants for me! Teaching my Teen son about – the beauty of giving back to those less fortunate. We have a Youth Emergency Shelter in Edmonton – would love to donate the card to the TEENS housed there, assist with their BTS needs. With 3 kids, the $300 would be spent fast! My first pick would be the Unicorn Hooded Jacket for both my girls! My oldest needs new pjs. She’s outgrown most of hers all of a sudden. My youngest needs some pants and indoor shoes. My middle child is hardest to shop for because she gets all of her sisters hand-me downs. But leggings/pants don’t seem to last these days so I’d get her some of these. I’ve lost some weight so I need everything. I’d like to get a new pair of jeans and a top. I also like H&Ms jewelry. I would split the money between a fall jacket for my husband and some fall/winter clothes for my baby daughter. She’ll need some warm outfits! I would spend the $300 gift card on a pullover sweater, Jeans, jean jacket, pjs, & a nice cardigan. Back to school shopping. I have been looking at the H&M summer slipper and dress for my wife and kid for a long time. Will definitely buy them! I need to buy some of the casual styles from H&M, they are not just for my kid, but look great on me too! H&M Denim are great value and quality. I would buy them. I would get one of the new Slacks for kids from H&M. If I’d won a $300 gift card, I’d stock up on 10 buttoned shirts to refresh my wardrobe. The Girls Lined Boots are gorgeous and both kids need new winter coats! They would definitely be on trend!! I would stock up on matching separates for my boys. Anything from the unicorn collection! We are in northern BC, and our travel future is up and down due to th fires, so a gift card would come in handy to order online. Sequined tops and all-white sneakers! My son could really use a couple of pairs of jeans, the Lego Ninjago shirt and a printed hooded jacket. Thanks for the chance. I would buy washed linen duvet covers and sheets for the beds in our house. My years of sending little ones off to school are over, so I’d use this gift card on myself. I’d purchase new outfits for work. I’d definitely get a girls sweater with sequinned motif and a few hoodies! All the things. I’d get all my girls the Tulle skirts with polka dots, the denim jeggings, and a bunch of motif shirts. So cute. I would spend it on leggings, shirts, and a few dresses for Sophie. I would use it to buy my son some jeans and shirts. I would buy the Off-the-shoulder Sweater for me and some back to school clothes for my grandsons. I like the Girls Biker jacket in pink for $34.99. I would spend it on back to school clothes for my kids. I’d get Yoga tight, leggings for my niece and jeans for my nephew. I would buy the Playful Denim for kids and sneakers as well. I love the Patterned Jersey Dress for my granddaughter and it’s only $5.99. I can get lots of legging, sweater for my two granddaughters and even a nice pair of jeans for me and a sweater if I win! Thank you! I would get some Mom jeans for myself then take my great grand kids on a shopping spree. I would be great fun. I would get my grandson jeans,hoodies & T’s. I would spend it on jeans and shoes. My son needs a new fall jacket. I was shopping there last week and spotted a few items for my daughter for back to school! I would buy leggings and lots of cute dresses! I would get some new shirts and pants for my kids. http://www2.hm.com/en_ca/productpage.0624304001.html. this sweat shirt and the sequin ninjago shirt you mention I think my son would really love. I would get some Boys’ Printed Jersey Shirts (like this one http://www2.hm.com/en_ca/productpage.0655580006.html), some Short Sleeved Sports Shirts (http://www2.hm.com/en_ca/productpage.0655580006.html), and as a treat for myself (for putting up with back to school craziness), I would get myself something pretty like a dress or a nice top. Thanks! My kids both need shirts, and I would definitely order the girls sweater with the puppy on it! The $300 would go a long way for back to school clothing. I would buy my boys some new sweaters for the upcoming year (because they always get lost!) and I would get a new pair of pants. I already bought the Awesome hoodie for my daughter and want to get the LOVE sweater too. I’d buy some new Chelsea boots for my father! I would Jeans, T-shirts, and a Windproof jacket. I would choose the Hogwarts Hooded Sweatshirt & cargo pants for my grandson, plus the Burnout-patterned Bath Towels and Washed linen fitted sheets, if I’m your lucky winner. I’d get the kids some sparkly reverse sequin shirts – they’re crazy about them. I’d buy myself the wool blended coat for the winter! Pants and shoes~ Definitely need more pants and shoes. Sweatshirts and cotton joggers for my son would be great for back to school. I like the jersey dresses and the leggings and so many other awesome clothing such as t-shirts and pants! That would be a start! 🙂 thanks! i would get the biker jackets for the whole family. how cool would that be? I would spend it on basics like t-shirts, socks, etc. I would get polo shirts, jeans and shoes for my son. The rest I would let my daughter choose her outfits! I’d be getting the Hooded Jacket and the Parka with Appliqué for each of the munchkins. If there were money left, I’d also love to get myself a fall coat, as I don’t have one. Thank you for the chance! Would love this prize to get all kinds of stuff for back to school for my 2 nephews ! Awesome giveaway ! Waterproof High Tops for sure – it’s rainy and slushy here all winter! My daughter wants all the sequin tops and possibly a sequin skirt! I’d wait for any upcoming collabs they have for winter, if any. I would get DD one of the awesome onesies, and let her go crazy in the accessories aisle (she loves the accessories!). I would buy outfit for all 4 of my grandkids. lve the coveralls. I would get new clothes for work: pants, cardigans and blazers. There’s a super cute floral pattern cardigan that would be the first thing I snag. I would spend it on some shoes, jeans, sweaters, shirts and a fall jacket for my nephew. I am absolutely obsessed with my simple cotton Tees from H&M so I would buy them in every colour! Plus they have the BEST toddler clothes so I’d spoil my daughter too. I would use it purchase some Back to School clothes and accessories for my kids. Getting ready for back to school would be a fun and fashionable experience. Off to pre-school she goes. Legging, fuffy shirts and long sleeves tops along with some purple runners. I’d get my girl a Padded Parka with sneakers and new school clothes. I would use most on back to school clothes but I’d get a new jacket for me. If I win I am sure most of the GC would be spent on their We ♥ Unicorns line/range for my daughter/back to school. I’d also love to get her a few hoodies, leggings, and the Padded Bomber Jacket, but she would be ecstatic over the Tulle Skirt, and the glitter sneakers! Thank you for the amazing giveaway! I would spend it on back to school stuff for my godson/grandkids. Thanks so much for the chance to win this awesome giveaway….. If I win, I would spend it on the padded vests, the Minnie Mouse hoodies, the Pile-lined Duffel Coats, and a few pair of sneakers and boots for my girls. The super hero sequin sweatshirt that converts from Batman to Superman! So cool! The maroon button up with white stars ✨ and the full parka suit and the ninjango scarf! And Mario socks! http://www2.hm.com/en_ca/productpage.0687027001.html These hightops are awesome. Would get these for sure and lots of your new t-shirts. it is my grandson first year at school. kinder garden. he needs everything. jeans, tops, coats, shoes etc…. Omg I would buy so many things. Sweatshirts with printed designs, tshirts and jeans for my twin boys!! I would buy the little biker jacket Jersey top’s with sequins and high top running shoes and many pairs of jeans. This would be great for my grandsons . I like the 2-pack Jersey Shirts . Love that sequin skirt. Just placed a large order yesterday for my 3 kiddos, definitely could use more winter gear though. I love this dress embroidered dress for my little girl! I would spend it on new boots, jacket, skirt and pants! All the girls and the boys need new shoes. They could all use new jeans or new tops. It would be wonderful to help them. Thank you for this amazing opportunity. My daughters love that they have animals on their clothing so we would for sure get something with animals. oh my gosh this would be soooooo useful! My girls have grown so much especially my oldest and because she is the oldest, hand me downs are never an option lol. I am totally loving the overalls and the padded outdoor jacket. The printed hooded sweatshirt and the cat sweater! My girls could always use leggings and jeans as well. I’d be getting my son some basics starting JK he needs easy comfortable clothes..
And some jersey dresses to wear with leggings! So many things to get! With 4 daughters, we would spend this super quick! Leggings, shirts, socks and undies! a Hooded Denim Jacket and a pair of Mesh Sneakers for my son! I’d spend the $300 on winter ready wear for every one. Sweater season full stop ahead! If I win, I would buy new shirts, pants and socks for my kid. Perfect for the back to school season. I need some new shoes, but my daughter says – everything! I always get my daughter leggings, long sleeve t’s, and some fun and funky pieces too. We need a biker jacket http://www2.hm.com/en_ca/productpage.0641199001.html and lots of leggings! I would love to pick up some new fall and winter clothes for my little one. An outdoor jacket (this Minnie Mouse one is too adorable http://www2.hm.com/en_ca/productpage.0637301001.html), a padded parka (just like mine that I got from H&M last year), and a pair of the pink glitter high tops are on the top of her list! I would buy joggers and some tshirts for my son. There clothes are adorable! Thanks! Definitely a new fall jacket and some sweaters. If I win I would get a few pairs of the cotton chinos in a variety of colours, a few pairs of the skinny fit jeans, the checked flannel shirt and the jumpsuit with hood for my boys. Printed Jersey Leggings, checkered and printed shirts, sneakers, so much to choose from! I would get these sweatshirts for my boys as well as jeans. I’d buy ankle boots for me, just because and a whole new set of clothes for my nephew who starts kindergarden! New jeans for our son! Leggins, jean jacket and jersey tops for my daughter. Jeans, polo shirts and pull on trousers for my son. I don’t have kids yet, but i would spoil my god child with a new fall jacket that they need. I love giving back and this would be a great way to spoil them and put the rest towards a charity supporting kids who need clothing for school. I would get the V-neck Cashmere sweater. I have one girl going into grade 1 and my youngest is heading to grade primary (kindergarten) so I would definitely spend this on some casual, clothes for school. I would spend $300 on the wool blend coat and the suede biker jacket! Chelsea Boots look pretty good for my 2 sons.